I’ve been railing against the conventional wisdom that more content is the magic SEO bullet for years now. In fact, for many of our clients, we’ve been proactively working on decreasing pagecount, instead of increasing it. There’s a great framework for assessing the value of investing more money on more content in a Searchengine Land article I wrote that essentially shows how to evaluate the efficacy of content in actually generating traffic. Simple stuff, but often overlooked – which is crazy given the vast investment many lawyers make in vomiting out more content at a regular clip. There’s an even easier way to review this through a very simple report in Google Search Console. 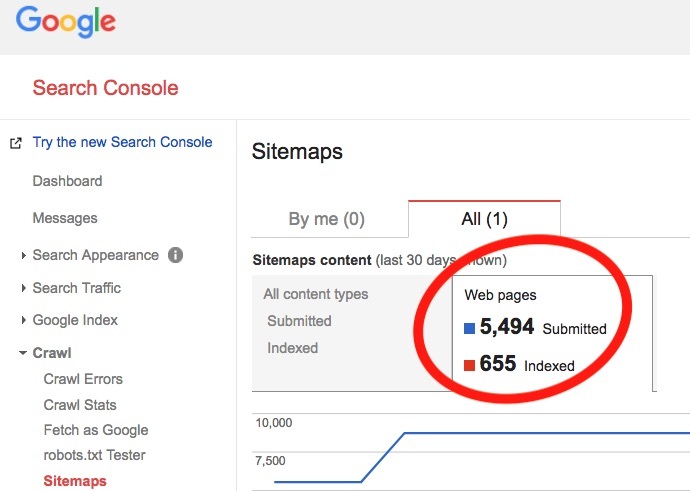 This simple report shows the number of pages in your sitemap compared to the number of pages in your sitemap that are actually indexed. In the extreme example below, less than 12% of their sitemap is actually indexed. This means while Google knows about the content, they don’t actually care and those pages will NEVER surface in search results. The site has a tone of content, yet lacks the authority (backlinks) to support the volume of content. The content on the site is extremely poor and/or copied. Assuming the sitemap is correctly configured…if the vast majority of your blog isn’t being indexed…why would one continue generating content?